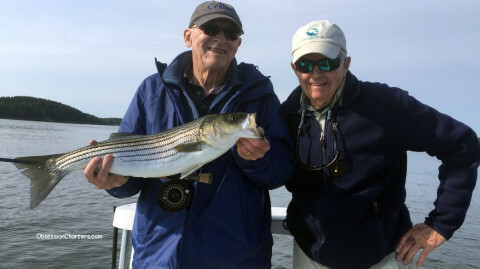 Jerry and Karl had a fun morning catching 20+ stripers on fly in just 4 hours June 29th. 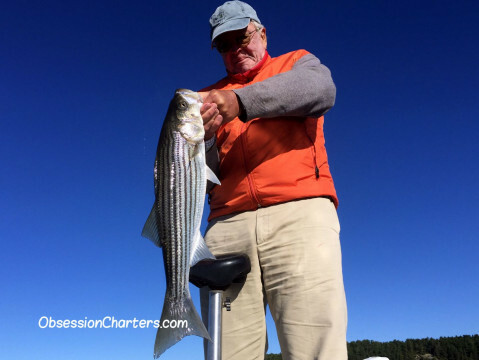 Conditions: The striped bass fishing is excellent both on fly and spinning gear. Lots of stripers in the River up to 32" with some biguns around. Water clarity is... cont. 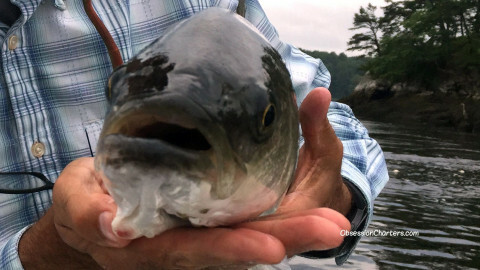 "Fly and lure size matters more than color right now..."
Conditions: The striped bass fishing is excellent. Lots of stripers in the River up to 32" with some bigger ones around. Water clarity is good, water temps range from 57* at the ocean to 76* upriver. Bait the fish are feeding on: sand eels, herring, alewife, eels, mackerel, pogies. Bait size range: 1 ½" to 15"
Fishing tactics: The surface activity has diminished this past week. The stripers are now feeding in 5'-20'of water. Watch for schools of bait and then fish around nearby structure. Your fish finder is your best friend right now. My fly fishing tip of the week: It is important to identify the size of bait that the stripers are feeding on. Once you have done that, experiment with different speed strips and fishing depths. My spin fishing tip of the week: Size matters more than color right now – match your lure to the size of bait the fish are eating. Soft plastics and bucktail jigs are working great. 7 day outlook: We'll have great fishing weather this coming week. They'll be light winds and some early morning fog. Maybe a showers later in the week. There are schools of striped bass spread throughout the Kennebec. We are catching 20-30 fish per trip on flies and lures! Sizes are ranging from 12' to 32" with some fish over 36". 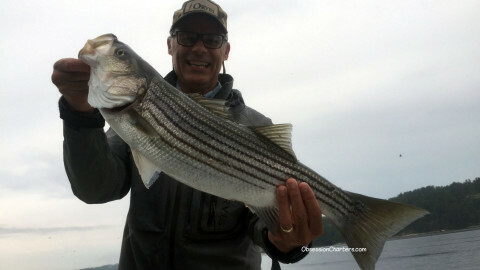 Doug Bear from Orvis with one of the dozens of striped bass he caught last week on his Helios 2 one piece 8wt fly rod. Stripers from 12" to 32" are spread throughout the lower Kennebec right now. Best fishing of the season is happening NOW! 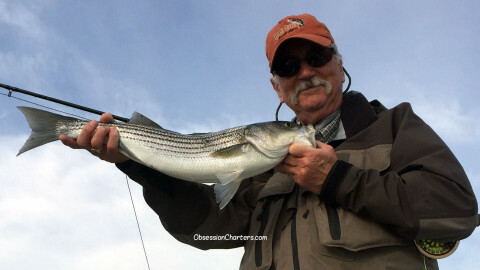 Jim Lyons caught over 30 striped bass up to 26" on flies July 18th.